KIEV, Ukraine -- Russia plans to eliminate Ukraine as an independent state and could spark a new offensive in the east to achieve that aim, Ukraine's prime minister told The Associated Press on Friday. Ukrainian Prime Minister Arseniy Yatsenyuk talks with reporters during an interview with the Associated Press in Kiev, Ukraine, Friday, March 27, 2015. Ukraine and the West accuse Russia of being directly involved in the separatist conflict in eastern Ukraine which has left over 6,000 dead in the last year. The cease-fire agreement reached in February requires both Ukraine government and rebel forces to pull back their heavy weapons. "This is a political solution. A diplomatically political solution, which has to be underpinned by the military capabilities of the Ukrainian army," he said. "The idea is just to deter the Russian terrorists, not to allow them to move further." Russian President Vladimir Putin's "main focus today is on the EU," Yatsenyuk said. "To split the unity among the EU member states, to lift sanctions. And to split the unity among the United States of America and the European Union." On Wednesday, police officers barged into a televised government meeting to detain two top officials on suspicion of extorting bribes. 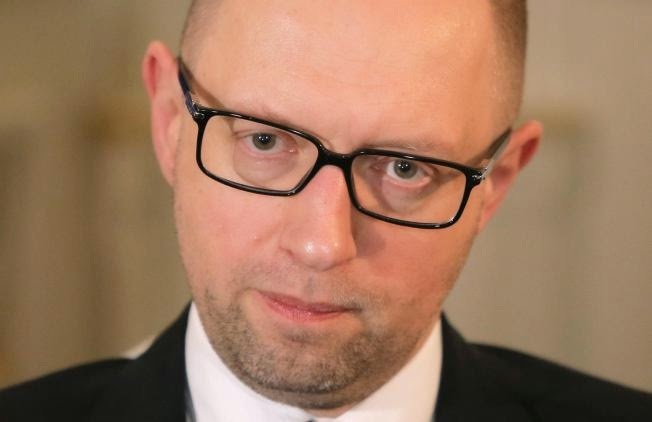 Yatsenyuk indicated that would set the pace for his government's looming fight against graft. "It is disgusting when the country is in the state of war and high-profile officials are just stealing the money from the pockets of ordinary Ukrainians," he said. "Everyone who violates the law, who commits any kind of corruption, will be brought to justice." The International Monetary Fund earlier in March agreed to extend $17.5 billion in loans to Ukraine as part of a program designed to pull the country back from the verge of economic collapse. Yatsenyuk said that kind of support would head off the default that many economic experts have predicted for Ukraine. "We are fully and entirely united," Yatsenyuk insisted. "We are floating in the same boat. And we are not eager to sink. We want to float." The austerity required by international creditors is pressing down on already-low standards of living in Ukraine. Yatsenyuk rattled off a series of harsh changes implemented by his government, which have included increases in taxes, a reduction in social entitlement programs and a freeze in state salaries.